First you must connect your account in order to see tasks that are assigned to you. Also, connecting an integration allows for time to be sent back to the third-party software. To get started, click on Integrations on the sidebar menu. Then make sure you have selected the correct organization on the top right corner of the page. Next, select the Gitlab logo from the list of available integrations. We have three separate integrations for Gitlab (cloud, self-hosted v8.x and self-hosted v9+). Select the one that is compatible with your current Gitlab configuration. 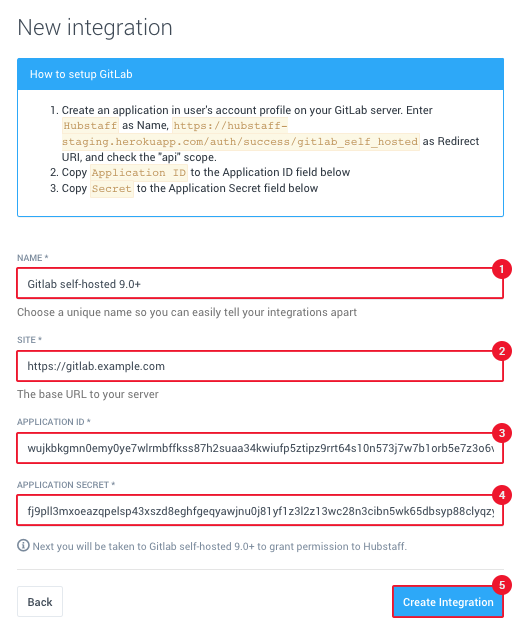 Enter your Gitlab URL (if your server is self hosted) in the Site field, your Application ID and Application secret, then click on Create Integration. Please make sure that the SSL certificate is correct and valid if you have a self-hosted Gitlab account. 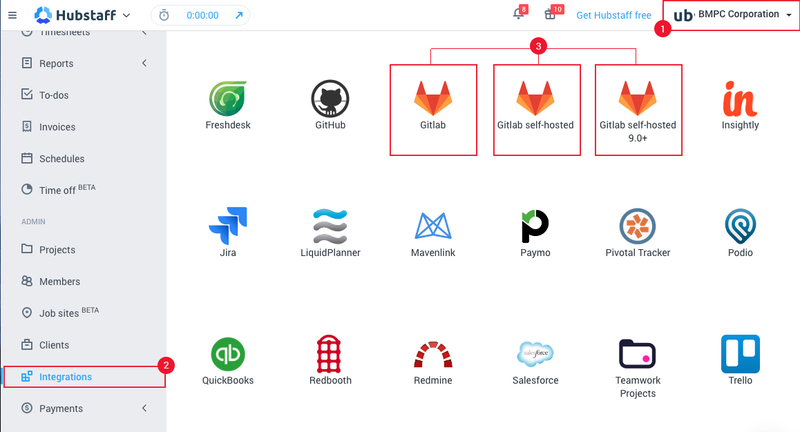 If you are using a self-hosted Gitlab you will need to update the redirect_url to https://app.hubstaff.com/auth/success/gitlab_self_hosted. If the integration requires that you add scopes, you’ll need to enable the API scope in Gitlab. 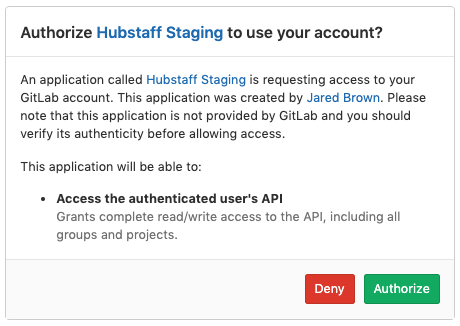 After authorizing the integration, you will be on the final step where you can link your Gitlab projects with Hubstaff projects. You will see all your Gitlab projects on theleft hand side, and the Link button on the right. 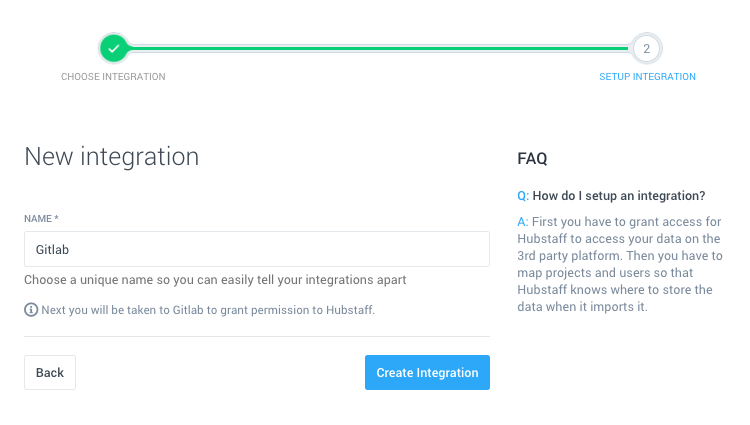 See how to link your Hubstaff projects and users and finish the integration setup. Linking users is just like liking your projects. Just like with projects, users can only be linked one time per integration. You will link your projects and users on the same place, and when you have done that everything will be saved automatically. After you’ve set up the integration, the app will be queued to sync automatically. When it has synced, your team will see their assigned issues in the app and be able to start tracking time to them. Your team will be able to see issue due dates, descriptions, and updates. When they’ve finished work on an issue, they can click the close button to complete the issue and automatically have the time posted to Gitlab. Tasks might not sync right away and can take approximately 5 minutes after linking your team. Also, please keep in mind that each time you add a new project or user to your project management tool, the integration needs be refreshed in Hubstaff for those changes to take effect, then link those accordingly. Subtasks are not supported with this integration.